« What Is Bounce Rate, Is It Important, and How Do You Lower It? One of the fundamentals of running a WordPress website is knowing how and when to update the core files, plugins, and themes that comprise it. In the past updating WordPress, while still relatively easy, had a bit more guesswork than it does today. Since WordPress 3.7 was released automatic updates for minor and security releases have become standard. It is also now possible to receive major or core updates without the site admin doing anything. This of course takes the guess work out updating WordPress for many users; an undeniable benefit. However, auto updates for WordPress are not the right solution for everyone. In today’s post I’m going to weigh the pro’s and con’s of enabling automatic WordPress updates and then show you how to configure them to best suit your needs. The benefits of automatic updates seem pretty obvious. If they just happen, in a stable and secure way, then that’s one less vital aspect of managing your WordPress site that you have to deal with or worry about. So what about the potential negative scenarios of automatic updates for WordPress? What are they and who do they affect? 1. If you’ve made customizations to the core of WordPress. Any automatic updates to those core files will override and erase those customizations. 2. If your site depends on third party (non-official WordPress.or) themes/plugins to function properly. You don’t want to run the risk of your site updating beyond the compatibility of your theme and plugins, resulting in those things breaking. This can result in something as mild (but annoying and unprofessional) as features/functions breaking and/or on displaying properly. Or in the worst case, your whole site could go down and that’s not fun for anyone. Those reservations (significant though they are) aside, there are still a few ways to protect yourself and automate parts of WordPress without opening yourself up to much (if any) risk. However, it should be noted: whenever you are about to update your site, whether manually or via a plugin or service–you need to back it up. In order to accomplish this with automatic updates you may need to automate your backups too. For more information on WordPress backups check out our post 10 WordPress Backup Plugins You Need to Know About. Once you’ve figured that out you can feel safe in putting the following automatic update solutions into practice. So let’s say you fall into one of those two groups and you’d like to disable automatic WordPress updates. To do that you will have to either edit your wpconfig.php file manually or use a plugin. In this section I will cover the manual method and below I’ll cover the plugin options. While this will disable WordPress automatic updates, you will still be notified when there is a new version available. So you don’t have to worry about it resulting in no updates whatsoever. It’s just on your terms at that point. Now let’s say you do not fall into either of the two groups I mentioned above. You have a very basic setup with themes and plugins that are always kept up to date and compatible with the latest version of WordPress. In your case automatic updates, even major ones, are ideal. This will enable all core updates. However, some people may not want nightly builds and development updates included–just the important security, minor and major changes. To disable those add the following bit of code to your functions.php file and you’re all set. Ok, so the manual solution will no doubt prove to be painless for many of you. However, I realize that not everyone is comfortable editing the files of their WordPress install–even if it’s just pasting in a line of code. Not a problem. 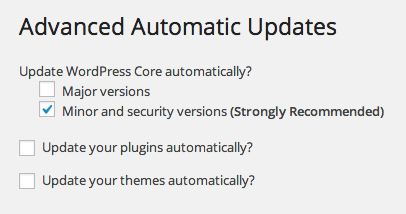 One of the contributing WordPress core developers created a great free plugin called Advanced Automatic Updates just for you. To get the plugin follow the link in the paragraph above, download it, and follow the installation instructions. Once installed, navigate to Settings > Advanced Automatic Updates and you’ll see a screen just like the image below. With a few clicks you can choose to update WordPress Core automatically for major versions or minor versions. You can also choose to update your plugins and themes automatically. However, the theme update feature only works for themes obtained through the official WordPress theme repository at WordPress.org. If you’ve made a third party purchase, you’ll have to update the theme manually. As is almost always the case with WordPress solutions, there are many ways to do the same thing. Automatic Updates are no exception. Below are the final three ways that you can arrange for automatic updates if the two primary/individual solutions above are not what you’re looking for. There are a lot of options out there for managed WordPress hosting. Bluehost, WPEnginge, Flywheel, and others all offer great services for a wide range of WordPress users. The goal of this section is not to highlight each service and compare them, but rather to simply mention that for the vast majority of managed WordPress hosting services automatic updates are part of what you’re paying for. They will make sure that the core of your installation stays up-to-date and secure. Some might update your themes and plugins too, but because those can vary so much that’s probably not standard. ManageWP is a plugin/service that brings the kind of integration and service features of a managed hosting provider or multi-site install to users who are managing any number of separately hosted WordPress.org sites. With their powerful dashboard you can access and updated anywhere from two to two hundred separate WordPress installs with a single click. Among many other awesome features. Not long ago I wrote an article here called How to Start a WordPress Management Business in Less than a Day. This post talks about how, using tools like ManageWP, someone with enough WordPress savvy could set up the basic elements required for that business in an extremely short amount of time and be up and running as soon as they could land their first customer. If that is not you (and you don’t even like the idea of installing a plugin like the one above) then perhaps hiring a WordPress maintenance or management service is a step in the right direction. Any good service of this kind will make sure your site, themes, and plugins are always up-to-date and running properly. WordPress updates are such a fundamental part of working with this platform that it’s a good idea to figure out what automatic updating option works best for you. Whether that be major updates, security updates, minor updates, theme or plugin updates knowing that everything is current, secure, and functioning properly can provide a great sense of peace and calm. It will also make sure your site doesn’t break. Which is pretty important, wouldn’t you say?